Wadi Rum is one of Jordan’s natural treasures with its vast desert and majestic rocky mountains. Our Resortwas envisioned to be like a desert village residing at the foothill of one of the dramatic mountains of Wadi Rum. Cars and tourist buses would park far from our site. Resort guests would be taken by horses and carriages to a reception court shaded by tents. 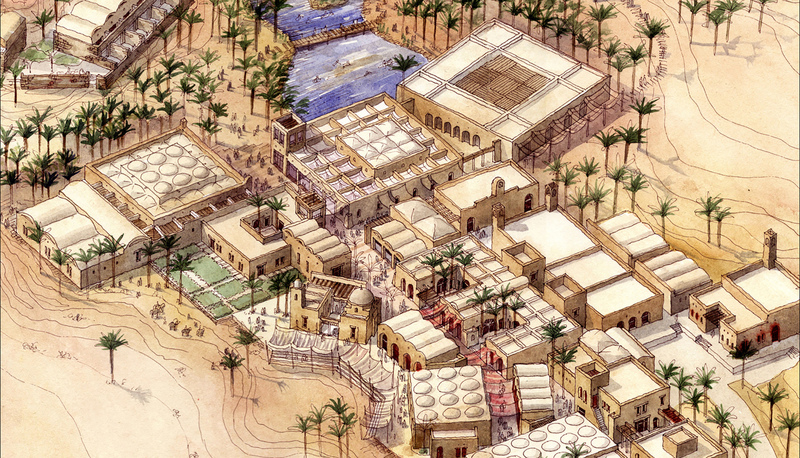 Upon checking in, guests would have to walk through the “Souk” passing by craft shops, cafes and restaurants in order to reach their guest rooms. The project includes Banquet Halls, Herbal Clinic, small Mosque, Camping site and an Observatory for night sky watching. This project tries to be ecological in nature, thus the use of natural local stone as the main building material. Domes and vaults are used as roofs adding to the special atmosphere of this unique experience.